Q: What do the “Christian beliefs” in the list below have in common? A: None of them are taught by the Bible. All of these beliefs were originated by human beings hundreds or even thousands of years after the Bible was written. Are they wrong? I think so. But the purpose of this article isn’t to show that they’re wrong. It’s to show that even though millions of Christians believe them, they are not actually taught by the Bible. They are human interpretations. People who believe these things quote many Bible passages to support them. But they can’t point to a single passage that clearly teaches any of these things. And some of these beliefs are specifically denied by the Bible. There are many valid Christian beliefs that require interpretation of the Bible. However, any belief that is essential or fundamental to Christianity and to salvation should be clearly taught in the Bible. It should not require interpretation. Does this mean that people who believe the things on the list will go to hell? Of course not! That’s not taught by the Bible, either. "We are Saved by Faith Alone"
Salvation by faith alone is the idea that the one and only thing that saves us is believing in Jesus Christ. Nothing we do, good or bad, has any effect on our salvation. Only believing that Jesus Christ died for us matters. Once we believe this, we are automatically saved. This idea is common among Protestant Christians—especially fundamentalist and evangelical ones. However, “faith alone” appears only once in the Bible, and in that one passage, it is specifically denied: “You see that a person is justified by works and not by faith alone” (James 2:24). Please read the whole passage, in which the apostle James teaches that faith without works is dead: James 2:14–26. The apostle Paul does not teach faith alone, either. When Paul said, “For we hold that a person is justified by faith apart from works prescribed by the Law” (Romans 3:28), he did not mean we do not have to do good works in order to be saved. He meant that those who believe in Jesus do not have to follow the laws of animal sacrifice, circumcision, and the other ancient Jewish ritual and behavioral codes found in the Hebrew Torah, or Law (the first five books of the Bible). In fact, Paul made it very clear that we must do good in order to be saved. See Romans 2:5–16. For Jesus’ own teaching about who will be saved and who will not, read Matthew 25:31–46. The doctrine of salvation by faith alone did not become a widespread “Christian belief” until after Martin Luther promulgated it as part of the Protestant Reformation in the 1500s. "There is a Trinity of Persons in God"
The idea that there is a Trinity of Persons in God is one of the oldest “Christian beliefs” that the Bible doesn’t teach. However, it still did not become a part of “Christian belief” until several centuries after the last books of the Bible were written. It was originated by human beings who were having trouble understanding the meaning of the Father, the Son, and the Holy Spirit mentioned in the New Testament. It’s not surprising that early Christian theologians were confused by the mention of the Father, the Son, and the Holy Spirit. Many of them were converted pagans, or came from pagan backgrounds and cultures. For these former polytheists, who were still surrounded by people who believed in many gods, the idea that there were three distinct “persons” of God probably seemed fairly ordinary. In short, the idea that Father, Son, and Holy Spirit form a “Trinity of Persons” in God is a human interpretation; it is not taught in the Bible. The Bible, long debated as the bestsellingest book of all time, might also be one of the most quoted texts. But how much of what is cited as coming from the Old and New Testaments is actually in the Bible? "Spare the rod, spoil the child"
This could very well be a paraphrase of Proverbs 13:24, but the statement doesn't really exist in any translation of the Bible. The Bible verse actually reads: "He who spares the rod hates his son, but he who loves him is careful to discipline him." Samuel Butler, a 17th century British poet, actually coined the phrase "spare the rod and spoil the child" in his satirical poem, "Hudibras" (read it here). (Photo: Wikimedia Creative Commons)Samuel Butler, 17th century British poet who coined the term "spare the rod, spoil the child" in his satirical poem "Hudibras." "Money is the root of all evil"
This misquote is not too far off from the actual verse, found in 1 Timothy 6:10: "For the love of money is a root of all kinds of evil. Some people, eager for money, have wandered from the faith and pierced themselves with many griefs." While some may want to suggest that this phrase could be a colloquial interpretation from the Book of Proverbs to sum up ungodly behavior, they would be wrong. The phrase, as profound as it may be, is not anywhere in Scripture. No, Jesus did not say this in the Sermon on the Mount nor in any of his teachings recorded in the Gospels. This Bible misquote might have its root in James 4:8: "Draw near to God and He will draw near to you. Cleanse your hands, you sinners; and purify your hearts, you double-minded." 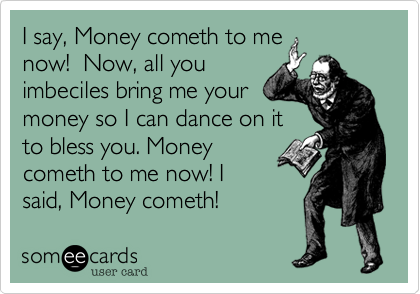 "Money cometh to me now!" This phrase, made popular by preacher Dr. Leroy Thompson and frequently chanted during his "Money Cometh to You" conferences is, unfortunately, not in the Bible. The phrase, also picked up by Kenneth Copeland, won't instantaneously attract unexpected income. Paul, credited with writing many of the New Testament letters, never wrote to the churches in Corinth or Rome declaring Christians to be "blessed and highly favored." As good as the phrase may sound, it's not in the Bible. This phrase might frequently be heard during sermons, when a preacher has a particular point he or she wants to get across — but, surprisingly, this saying isn't in the Good Book. Christians are admonished throughout Scripture to love their neighbors, but there is nothing in the Bible about turning to your neighbor, high-fiving your neighbor, or touching your neighbor. "All things work together for good"
This is another passage in which context is key — what things work together for whose good? Romans 8:28 reads in full: "And we know that in all things God works for the good of those who love him, who have been called according to his purpose." This might be a universal confession among all Christians, but this phrase is stated nowhere in Scripture. Perhaps the phrase can be linked to Isaiah 55:8: "'For my thoughts are not your thoughts, neither are your ways my ways,' declares the LORD." "Pride comes before the fall"
This phrase often attributed to the Bible is almost correct. The actual verse, found in Proverbs 16:18, actually reads: "Pride goes before destruction, a haughty spirit before a fall." 67 Surprising Things Not Found in the Bible; How Many Can You Guess? They Bible calls them Magi, not “Wisemen”, though the two are synonymous in common parlance. The Magi are found only in Matthew 2 and no number is given to them (three comes from the number of gifts given). This idea behind this phrase originates from Aristotle’s ethics and the direct quote comes from Rome, several hundred years before Christ. Two different Romans are generally given credit – one named Terence and the other Petronius. Comes from a Hymn (“God Moves in a Mysterious Way”) by William Cowper, who lived in the 18th century. Matthew 6:22 says “The lamp of the body is the eye”, but there is no reference saying it is a window to the soul. There is no consensus as to the origin of this phrase. Some attribute it to a proverb of varying origin and others to several writers including Shakespeare and Milton. 11 – The Apple in the Garden of Eden. There was fruit from the tree of knowledge of good and evil (Genesis 2, 3), but we do not know what kind of fruit is was. The apple grew out of Christian tradition and may have been a result of artists trying to depict The Fall. It might also have come from the Latin word for evil (“malum” = evil / “malus” = apple). Some say it was likely a pomegranate. But, we do not know. Not even close to a Biblical reference – this comes from Thomas Tusser who wrote it in 1573 in in Five Hundreth Pointes of Good Husbandrie. The origin of this phrase isn’t even Christian. It comes from a Persian Sufi (Muslim) poets some time in the middle ages. The list of the 7 deadly sins = wrath, greed, sloth, pride, lust, envy, and gluttony. The first evidence of the list is from a monk in the 4th century. The list was then altered slightly by Pope Gregory I in 590. It was then popularized by Dante in his Divine Comedy. 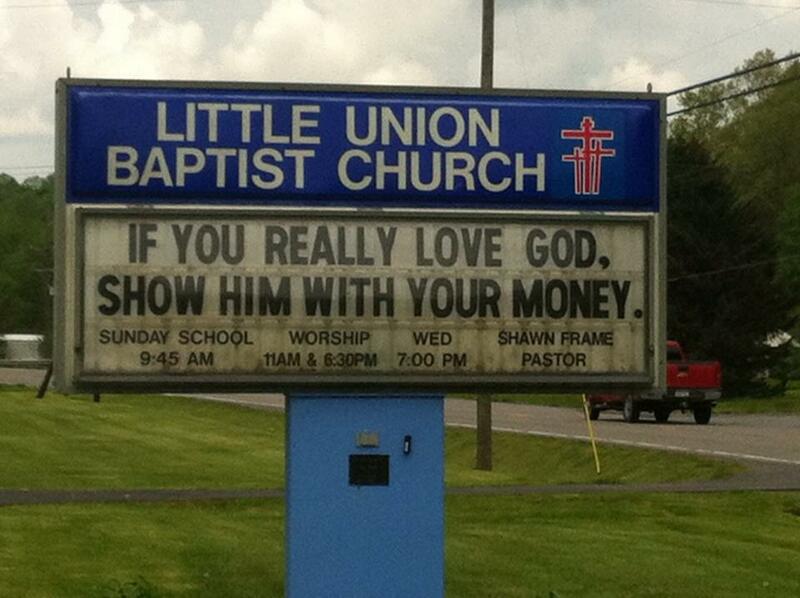 1 Timothy 6:10 says “For the love of money is the root of all evils”. It is the love of money that causes the problem, not the money itself. Money doesn’t have a moral value all to itself, it is what we do with it that makes the action good, neutral, or evil. The origin of the misquote is unknown, but The Beatles’ song “I’m a Loser” has the line in it. Generally credited to Terence, the Roman comic writer. It is sometimes also attributed to Sir Thomas Browne who wrote the phrase in 1642. Comes from Hamlet by Shakespeare. In a bit of context the quote reads, ”This above all: to thine ownself be true, And it must follow, as the night the day, Thou canst not then be false to any man.” Not bad advice, but not from the Bible. While there are many references in the Mosaic law to cleanliness (esp. in Leviticus), there is none that we can ascribe to this quote. Some say it comes from a 2nd century Rabbi. We know the first English version comes from Francis Bacon. He wrote the following in Advancement of Learning, “Cleanness of body was ever deemed to proceed from a due reverence to God.” John Wesley then changed it to the phrase we use today. This very common phrase comes from Algernon Sydney, who wrote it in an article titled Discourses Concerning Government. It was then popularized by Ben Franklin in 1757 in Poor Richard’s Almanac. In many ways this phrase is wrong, because God helps (saves) those who can NOT help themselves (sinners). Though we must agree to allow Him to help us. An earlier form of the phrase may have come from “God loves to help him who strives to help himself” by Aeschylus (6th C BC). "God helps those who help themselves"
"Saint Peter will be at the gate"
38. Any direct linking of Mary Magdalene being a prostitute or woman of ill-repute. Ditto any direct mention that Herodias' daughter was doing any kind of suggestive dance.